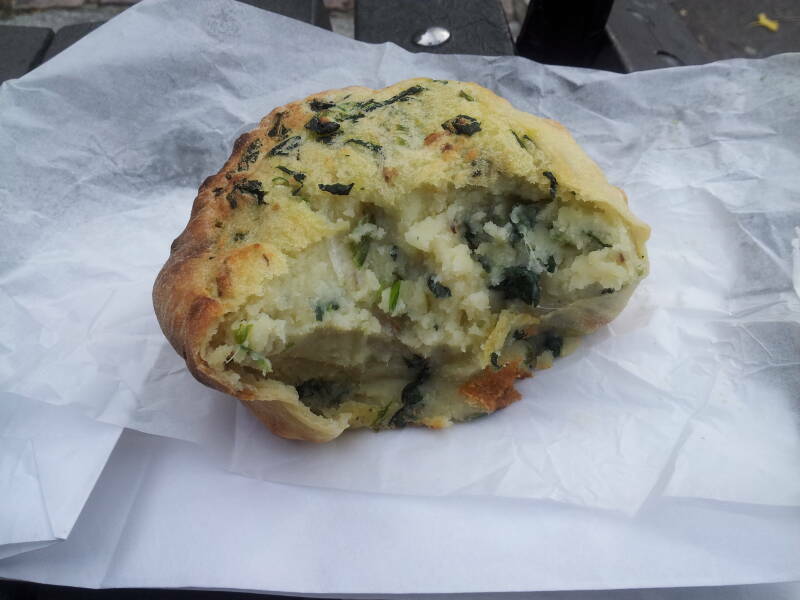 A knish is some type of filling wrapped in dough that is then baked, grilled, or deep fried. They range in size from very small to about like a sandwich. Ukrainians seem to have come up with the concept of the книш, which Polish spells as knysz and Yiddish as קניש. The traditional recipes focused on fillings of potatoes, kasha (or buckwheat groats), onions, and cheese. Today, most anything goes. Yonah Schimmel, an immigrant from Romania, started selling food out of a pushcart at Coney Island in the 1890s. 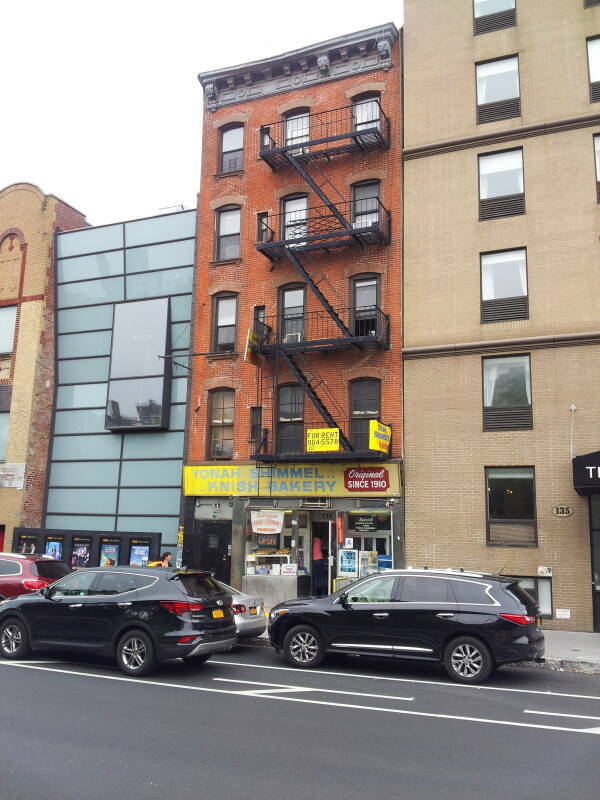 In 1910 he and his cousin Joseph Berger opened this business at 137 East Houston Street where knishes have been made and sold ever since. This is the oldest knishery in New York. Yonah left the business after a few years, his daughter and her husband took it over and kept the name. Yonah's great-nephew Alex Wolfman owned it in the 2010s. 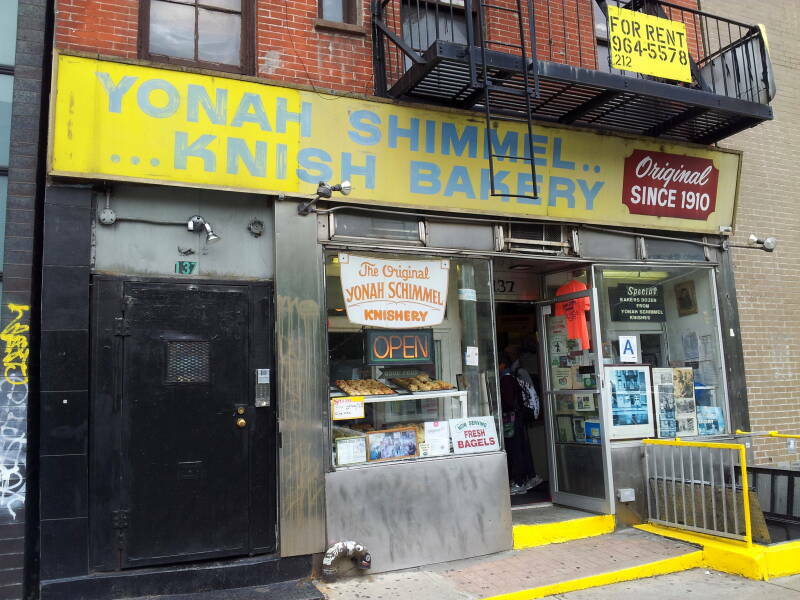 Yonah Shimmel Knishery at 137 East Houston Street near Eldridge. 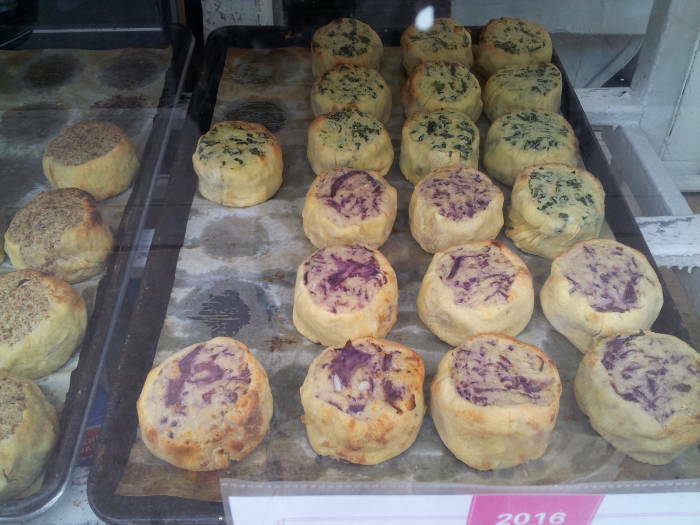 Knishes in the window at Yonah Shimmel Knishery. 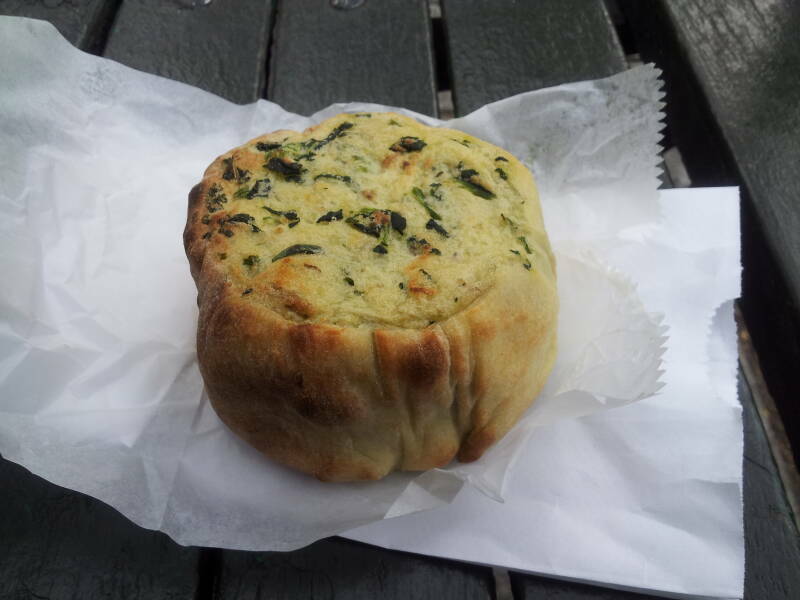 Spinach knish from Yonah Shimmel Knishery. Joel Russ immigrated from Poland around 1905 and started selling mushrooms. He carried them in a basket until he made enough money to buy a pushcart, and then he sold them from the pushcart until he had made enough money to open J. Russ International Appetizers in 1914. 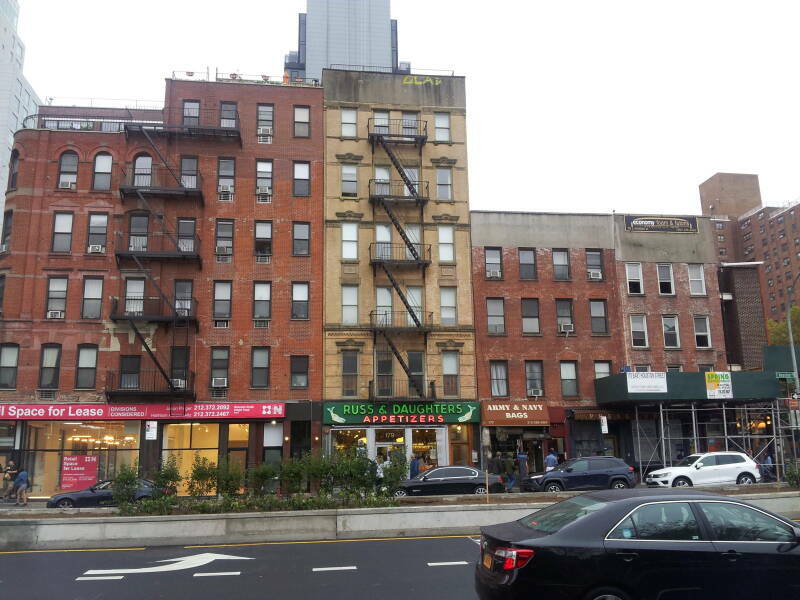 In 1920 he moved the business just around the corner to 179 East Houston Street, where the Russ family has operated it ever since. 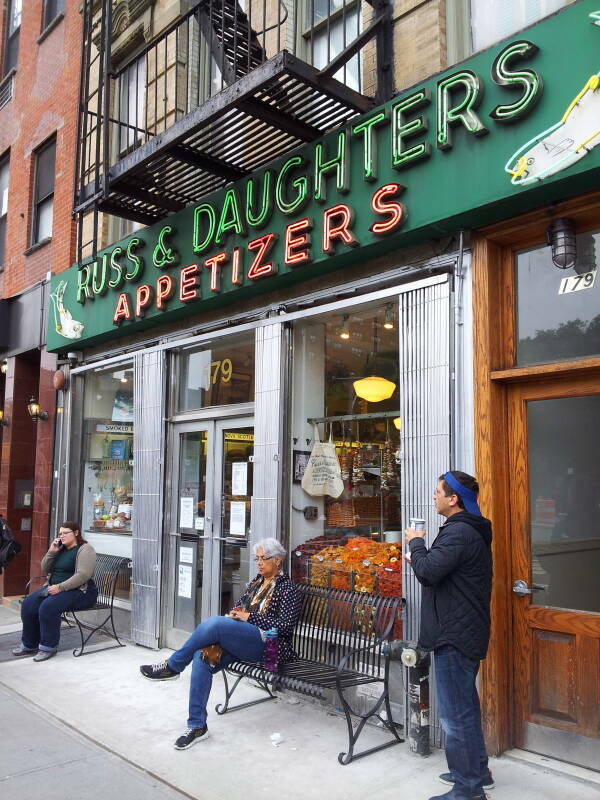 In 1933 his three daughters had become partners and they renamed the business Russ and Daughters. The girls had all worked on weekends since they were eight years old, and worked full time after finishing high school. 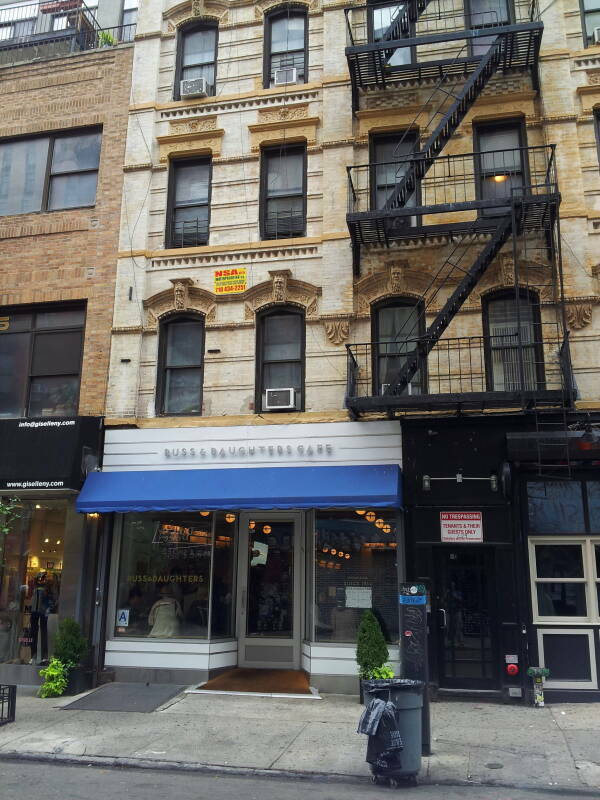 In 2014 the family opened the Russ and Daughters Café a few blocks south on Orchard Street. Russ and Daughters at 179 Houston Street near First Avenue. The neon sign, one of the oldest ones operating in Manhattan, says "Appetizers". You would get bagels at the bagel shop, them come here to get the appetizing, which is "the food you eat with bagels". The appetizing might be a dairy product like cream cheese spreads, or it might be parve, meaning "neither dairy nor meat", such as lox or smoked salmon. Jewish kashrut dietary laws forbid having both meat (kosher fish isn't considered to be meat) and dairy at the same meal. Saying "fish is not meat" isn't at all strange, as that's exactly what the Roman Catholic Church says. What is strange is that in the 17th century at the request of the Bishop of Quebec, and around that time on behalf of the Spanish forces in today's Venezuela, the Roman Catholic Church decreed that the semi-aquatic mammals beavers and capybaras are fish. As for actual fish and other sea creatures, to be kosher it must have scales that are visible to the naked eye and easy to remove. If the scales can only be removed after soaking the fish in scalding water (e.g., sturgeon) or if it has scales when it is young but not when mature (e.g., swordfish), there are differing views but in general they are not considered to be kosher. So definitely no shellfish, crustaceans, or cephalopods. And fully aquatic mammals such as whales, dolphins, and manatees have no scales, and wouldn't be allowed. The Islamic halal rules are the same. 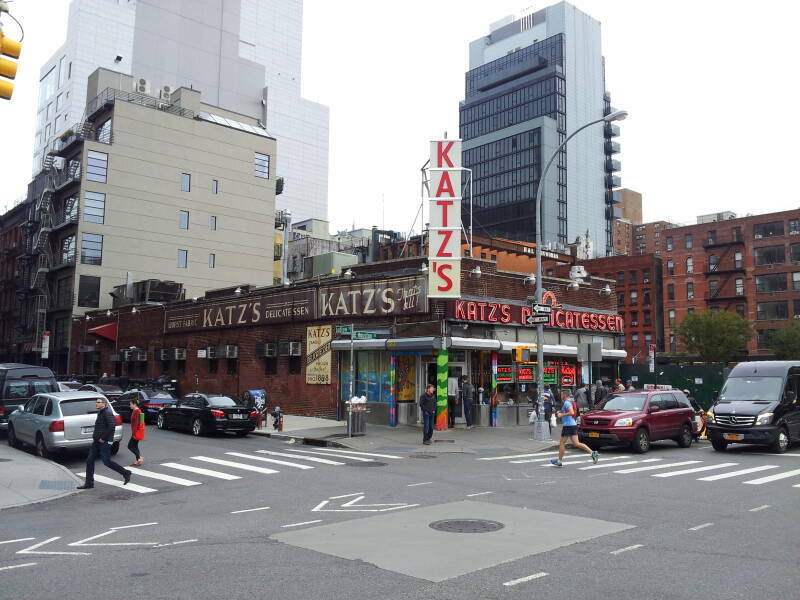 Established in 1888, Katz's is the oldest delicatessen operating in New York. It's at 205 East Houston Street at Ludlow. It's only deli-style and not an actual delicatessen, at least according to Jewish dietary laws, as it sells both meat and dairy products. It's enormously famous, mainly for appearing in the movie When Harry Met Sally, and the predominantly tourist crowd is charged high tourist prices. What is a synagogue? What is distinctive about its design and contents?